Takahashi FSQ-106ED @ f/5.0 (530 mm F.L.) Captured at 2.1 arcsec/pixel. Shown at 4.2 and 9.38 arcsec/pixel. 11/10/2013 to 1/29/2014 Chino Valley, AZ... with CCDAutoPilot5 & CCDSoft. No SDSS stars were available for color balancing, so a standard image-train calibration was used, as determined by eXcalibrator v4.30, and then adjusted for altitude extinction. PhotoShop for the LRGB combine, adding Ha data to the red channel & final touch-up. 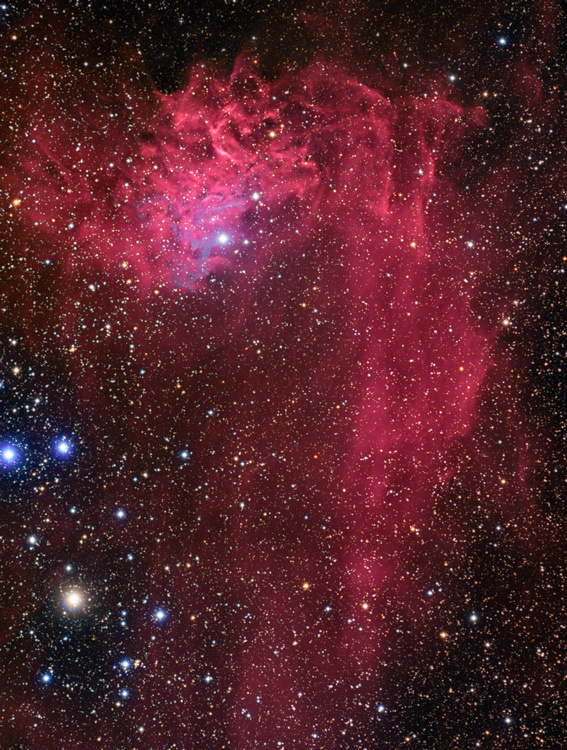 The nebula is shown with North to the top.